Steven Strogatz is a professor of applied mathematics at Cornell University. I own two of his books, Sync (2003) and Nonlinear Dynamics and Chaos (1994), read some of his papers Exploring complex networks (Nature, 2001), watch him on TED and also encounter him as a sometimes guest on Radiolab. His interests lie in mathematical biology and nonlinear dynamics and chaos. 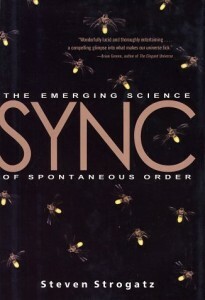 Sync is an equation-free and entertaining to read popular science book, much in the lines of Johnson’s Emergence and Waldrop’s Complexity. Here’s a summary of the items i found most interesting. The cosmological rhythm of the earth’s rotation dictates a 24-hour day. A cluster of cellular oscillators in our brain is responsible for creating our body’s biological clock. This circadian pacemaker is in control of cyclic behavior of organs, digestion, sleeping pattern and body heat. Besides the internal clock, we follow the external clock of sunlight and typical 24-hour day scheduling. 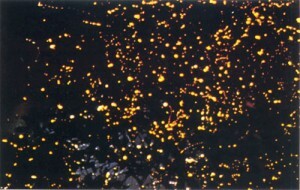 This synchronization with the natural clock is called entrainment. Experiments proof that our biological clocks actually tick at a longer cycle time than 24 hours. It’s different from person to person, but a normal circadian rhythm lie around 24.5 to 25 hours per cycle. Interesting to note as well is that our biological cycle controls how well we sleep. Depending on when we go to sleep in relation to the temperature minimum and temperature maximum of our body heat cycle, we sleep bad for only a few hours or fall into an unexpectedly long sleep of 10-12 hours. People with insomnia people might have an exceptionally long internal circadian rhythm that makes it hard to synchronize with the external rhythm. Else: synchronizing pendulums, Josephson effect, the Millennium bridge, 3-dimensional Belousov–Zhabotinsky waves, small-world networks and six degrees of separation. Every decade had it’s grandiose theory: In the 1960s it was cybernetics. In the ‘70s it was catastrophe theory. Then came chaos theory in the ‘80s and complexity theory in the ‘90s. This poses of course the question what’s next? He states the complexity theory has largely failed in explaining where the unexpected emerging order comes from in a mathematical sense. 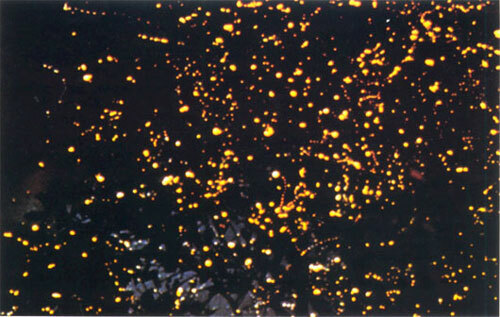 Also that it failed in tying the theory to real phenomena in a convincing way. Chemist Ilya Prigogine feels that the key to complexity lies in a deeper understanding of thermodynamics, the battle against entropy. And some believe that uncovering the universe’s last secrets, possibly that it might just be one giant computer, might lead to the end of science. 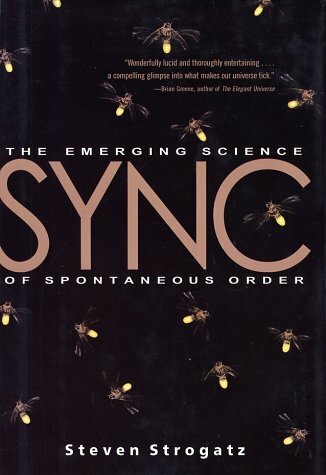 Posted in circex, Research and tagged 2010, book, circadian rhythm, complex system, oscillators, self-organization, Steven Strogatz, synchronization.